The theme of the 2014 Annual School responds to the inclination of the modern conservation industry to loose sight of the artistic ‘poetry of conservation’ The School reasserted the notion of conservation as a cohesive ‘art’ based on sound principles. It sought to rebalance the essential yet more practical competencies of evaluation, management and intervention and to reconnect with the thinking and aspirations of those ‘educated, artistic people’ William Morris stressed were at the root of the discipline. of the 2013 School can now be seen by all at http://ihbconline.co.uk/context/131/. Alongside this material the web site also carries Annual School resources in perpetuity (http://www.ihbc.org.uk/learning/page38/index.html) including programmes, speakers presentations and feedback details ensuring that the key aspects of the School are available for open public reference and future research. This ensures the educational benefits of the School are available to all not simply IHBC members or those who attend. The IHBC Annual School helps members’ meet the IHBC’s Areas of Competence and maintain these competencies. These Competences are the key membership criteria of the Institute and Annual School programmes are developed to cover as many aspects of them as possible. The Competences are shown in the table below (with more information available at http://www.ihbc.org.uk/join/). The Areas of Competence are, however, equally relevant to non-members, conservation professionals and other built environment professionals. The Professional Area of Competence informs and shapes conservation advice and conclusions, and is the most important and most challenging for applicants. The Practical Areas of Competence correspond to how we achieve conservation, by evaluating, managing and, as appropriate, changing places. These Practical Areas correspond respectively to cultural disciplines such as history or archaeology; to ‘place management’ and regeneration specialisms such as planning; and to design and technical solutions provided by architectural, engineering, urban design and project management skills sets (http://www.ihbc.org.uk/skills/). 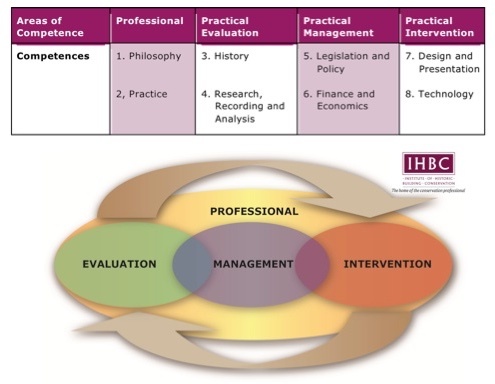 The IHBC’s four Areas of Competence, as represented in the model conservation cycle, in figure 1 below, represent members’ inter-disciplinary skills – the overarching ‘Professional’ Area of Competence, and the three Practical Areas: ‘Evaluation’, ‘Management’ and ‘Intervention’. For conservation professionals including IHBC members and prospective members, issues around significance lie at the heart of the first of the IHBC’s ‘Practical Areas of Competence’, Evaluation. Significance also underpins advice and decision across all the IHBC’s Areas of Competence. 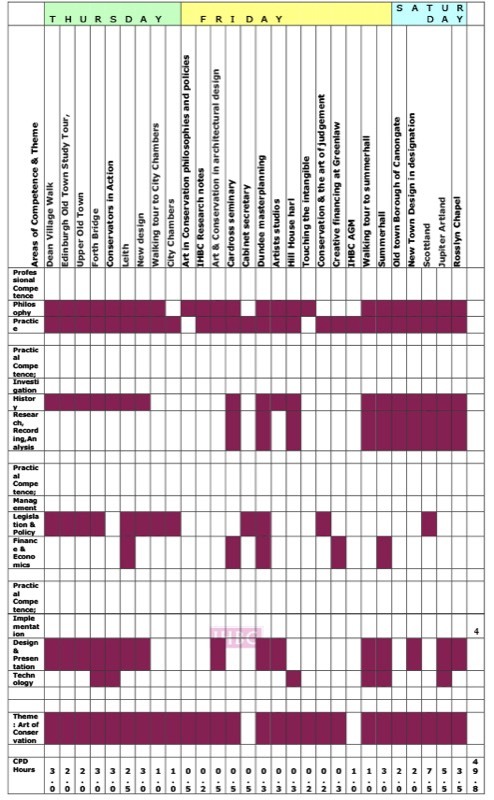 The matrix below (figure 2) explains how the 2014 Annual School provided training to meet the IHBC Areas of Competence and also dealt with the theme of the school. It shows that the Annual School sessions provided training options to cover all of the IHBC Areas of Competence whilst giving specific training on the School theme of “The Art of Conservation”. It is possible using the various options available for delegates to further develop all or some of their competences. To ensure maximum delegate feedback delegates are directed within two days of the end of the School to an electronic survey form. This approach, first used in 2009, has proved to be very successful. It simplifies the process of submitting feedback for delegates, allows them to make any additional comments with ease and has been shown to deliver more responses than paper feedback forms. In 2014 48.9% of delegates responded with delegate feedback. Attendance at the Annual School over the past decade has been consistently good and in 2014 the School attracted 184 delegates (83 Day School and 101 Full School). Although the event is organised by the IHBC and is a key annual event for its members it provides training for non-members and all those with a professional interest in conservation. The Annual School continues to provide important training opportunities for those outside the Institute and in 2014 the number of non members attending increased was 10% more of the total delegates than the previous year. In 2014 26% of the School delegates (35 Day School delegates and 13 Full School delegates) were not members of the IHBC, demonstrating the School’s wider appeal. Delegates to the Annual School come from a variety of different types of employment falling into the four broad categories shown in Figure 1; Local authorities, private practice, government bodies & quangos and charities and education bodies. The Full School also include delegates in receipt of the bursaries offered by the IHBC either nationally (http://www.ihbc.org.uk/edinburgh2014/school-bursaries.html) or through bursary schemes run by various IHBC branches. 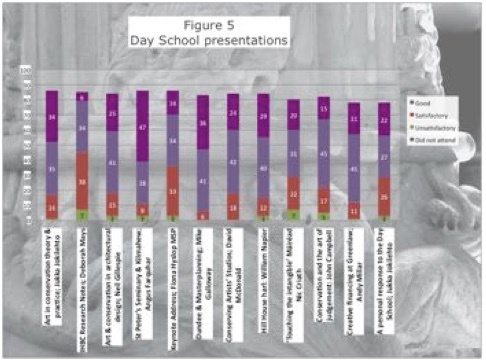 Delegates were asked to rate the Day School presentations and the results are shown in Figure 5. 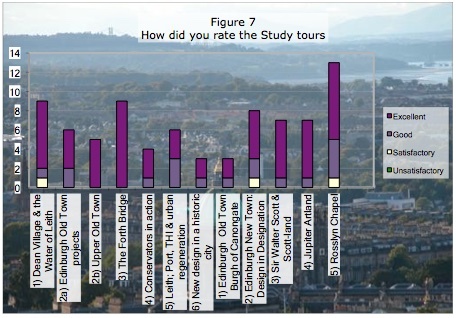 Those presentations most rated as excellent were Angus Farquhar’s discussion of the artistic reinvention of Cardross seminary, Mike Galloway’s description of the Masterplanning for Dundee and the context setting talk by Jukka Jokiletho on Art and conservation in theory and practice. All talks were rated excellent by some delegates and very few delegates felt that any talks were unsatisfactory. Delegates were asked to rate the organisation of the conference and the booking arrangements. 99% of delegates rated the organisation of the School as good or excellent (see figure 8). Delegates rated the main School venue highly with 98% feeling it was a good or excellent venue and none feeling it to be unsatisfactory (see figure 8). The booking arrangements were likewise rated as good or excellent by 95% of delegates. usefulness very highly with 91% rating it as good or excellent. (See figure 9). The generally high level of satisfaction is backed up further by the very encouraging data in figures 10 and 11 which reveals that 87% of delegates felt the School met their training requirements completely or sufficiently and that 97% felt the School was invaluable, very useful or useful. Provided a 3-day course in Edinburgh in June 2014 of focused training for conservation professionals which include a series of different training methods including lectures, visits, networking etc. Was rated as excellent or good by 87% of Day School delegates. 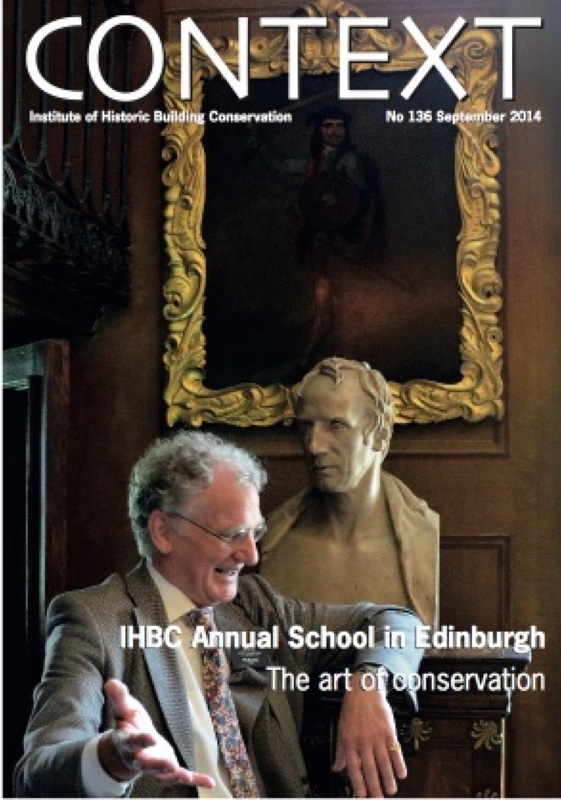 The proceedings of 2014 Annual School have been described in some detail in Context the journal of the IHBC (Issue 136 September 2014) and this is a main source of record that will endure beyond the event. Six months after publication the Annual school edition of Context is made available freely to the public on the IHBC web site. Alongside this material the web site also carries Annual School resources in perpetuity (http://www.ihbc.org.uk/learning/page38/index.html) including programmes, speakers presentations and feedback details ensuring that the key aspects of the School are available for open public reference and future research. The successful delivery of the 2014 School has reinforced the importance of the IHBC Annual School in the annual training calendar of conservation professionals and provided the opportunity for delegates to obtain quality, focused Continuing Professional Development.